Ok figuring out how to run the pipe for the bathroom drain got more difficult than I expected. 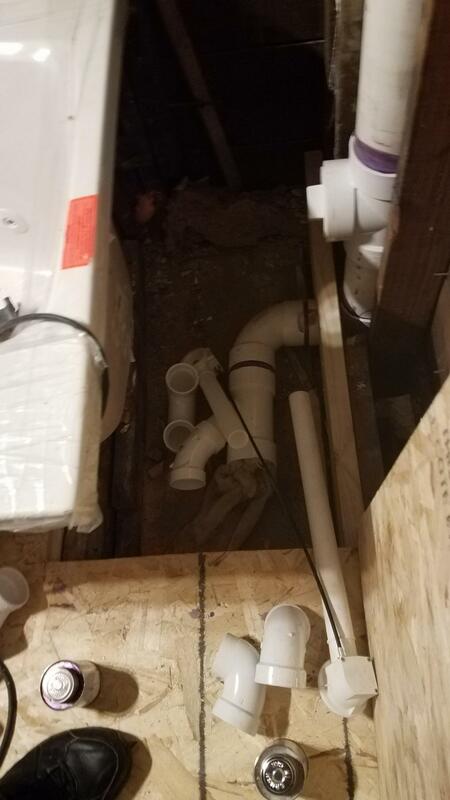 In order to fit the trap it has to run away from the stack and make a u turn before joining unti the 3" going to the toilet. Or is there something I should do differently? I'm just a lay person doing DIY as a loner. Eliminating K&T, L&P and sagging structure one room at a time. Doesn't look that far but I think better pics or diagrams would help get your point across. Well I'm having a heck of a time making time for this project these days with work overtime 7 days and the kids causing trouble at school. With that said, the 3" pipe is meant to continue on to the toilet. The 2"y is meant to serve the tub. The u bend sitting next to the y roughly represents where the trap needs to sit under where the tub drain will come down. I am thinking that the unpleasant reality is that instead of the 3" 90 coming out of the stack I probably should've used a 3" combo and then reduced to 2" on the straight. This means disassembling already glued joints. Is there a way without disassembling already glued joints would be the question I guess. Your wye is back wards. Well I see it would be easier to connect to the tub if I turned the wye around, but code doesn't allow it to be installed the other way and I would not care to have toilet water diverted into the tub drain. Your draining the other way my mistake. You will need to vent the tub. I would cut the 3" San tee out. Replace it with a left hand side inlet san tee (3"). Then use the 2" side branch for the tub. It will require 2, 2" 90 as well to line up the trap. By doing this, the tub will be vented at the 3" vent stack- assuming that's a vent and not a drain stack. BTW, what's your plan for the clean out tee plug?